The Toyota Yaris comes in four variants - J, G, V, and VX, which are further segmented into eight iterations based on engine and transmission option. 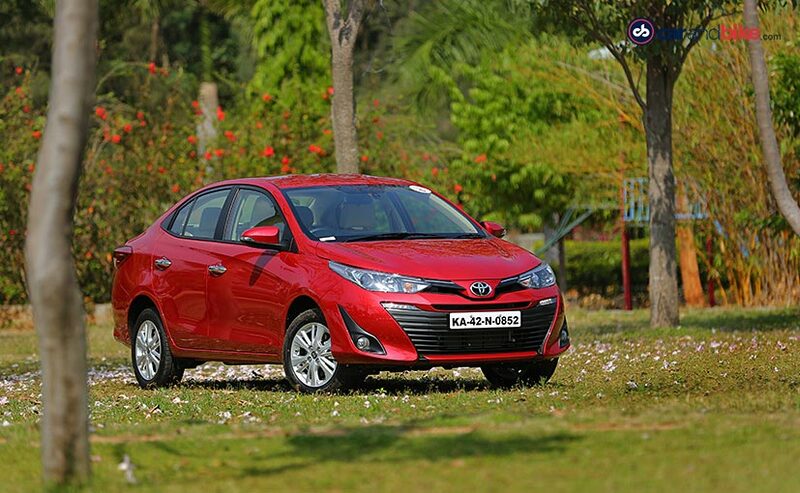 Toyota is all set to officially launch the new Yaris sedan in India tomorrow, on May 17. The company had announced the prices for the Toyota Yaris last month when it started accepting bookings for the car. Priced from ₹ 8.75 lakh to ₹ 14.07 lakh, the Yaris come with only one 1.5-litre petrol engine on offer and in manual and automatic option. The car is primarily available in four variants - J, G, V, and VX, which are further segmented into eight iterations based on engine and transmission option. 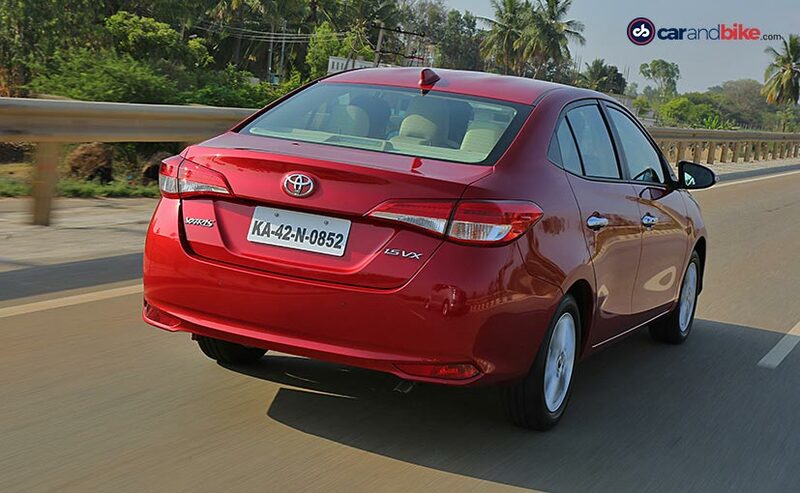 In India, the Yaris takes on segment leaders like - the Honda City, Hyundai Verna, Volkswagen Vento, and of course, the Maruti Suzuki Ciaz. To make it a fair fight, Toyota has equipped the car with a host of smart and safety features right from the base model and here's a detailed variant-wise explanation. Starting with the exterior, even in the base model or the J variant, Toyota Yaris comes with features like projector headlamps, body coloured ORVMs and door handles and a shark fin antenna as standard across the model range. The J variant runs on a set of 15-inch steel wheels with wheel cover and disc brakes for only the front wheels, while the rear gets drum brakes. Similarly, the cabin too comes with the dual tone, black and beige theme and a waterfall design centre console. The base model only gets a standard Audio System with CD, MP3, AM / FM player along with USB, Aux-in, Bluetooth connectivity. The car offers four speakers, a Multi-Information Display (MID) + Eco Indicator, fabric interior, a cooled glovebox, and cabin lights. On the equipment front, even the base model of the Yaris comes with features like - height adjustable driver's seat, 60:40 rear split seats, keyless entry, tilt adjustable steering wheel, electrically adjustable outside rear-view mirrors, all 4 power windows, power steering, and a rear armrest with cup holders. 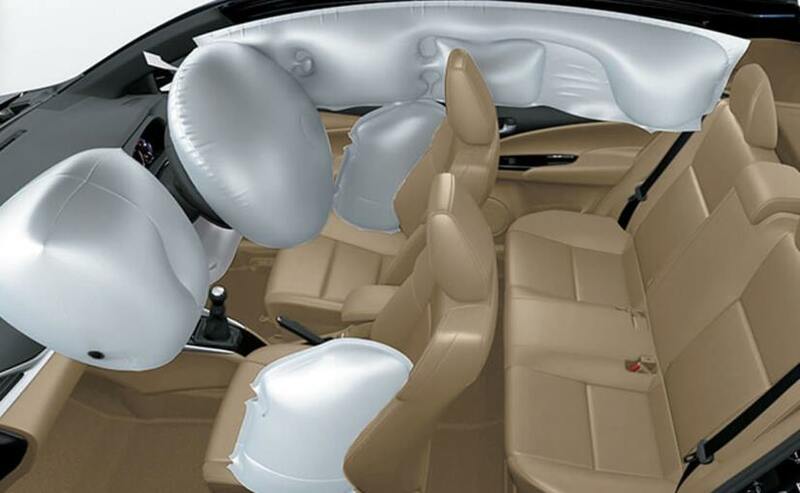 On the safety front, Yaris is the first car in this segment to offer 7 airbags (2 front + 2 curtain + 2 side + 1 driver knee airbag) as standard across the model range. ABS with EBD and brake assist, central locking and engine immobiliser. Toyota offers the 7-step Super CVT-i automatic transmission as an option right from the base model, in addition to the 6-speed manual gearbox. In addition to the features offered on the base variant, the G variant only one exterior feature - turn indicator lights integrated into the outside rear view mirror (ORVM). This one too comes with steel with wheel cap. The cabin, however, gets an additional 7-inch LED touchscreen infotainment system with segment first gesture controls. The system offers audio playback with USB, Aux-in, Bluetooth connectivity in addition to Weblink, MiracastTM, HDMI, and it even gets a remote control. Furthermore, instead of the regular instrument cluster, all variants from the G and above get a 4.2-inch TFT display along with fully-automatic climate control and rear reading lamp. The equipment list grows longer from the mid variant G with offerings like - first-in-class roof-mounted air vents with ambient illumination, acoustic & vibration control glass for better sound-proofing, a smart key, push-button start-stop function, steering-mounted for audio, Phone, & MID controls, and electrically foldable ORVMs. Safety features include rear parking sensor, front and rear fog lamps, rear defogger, and speed sensing door lock and impact sensing door unlock feature. 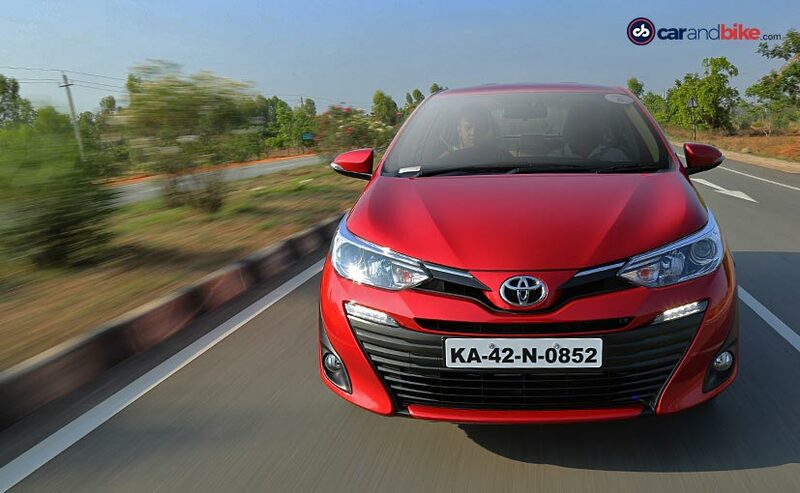 Adding over the G variant, the Toyota Yaris V trim offers a host of premium features like - LED guide lights with the projector lamps, and rear combination lamps, also with guide lights. The V variant also features styling 15-inch alloy wheels with all four disc brakes. The cabin on the other hand now comes with 6 speakers instead of 4 along with other features like - cruise control, and rain sensing wipers. Safety features will include front parking sensors, 4 rear parking sensors, reverse camera, auto headlamps, and follow-me-home headlamps. In addition to the features offered in the V trim, the top-of-the-line VX variant of the Toyota Yaris comes with offerings like - LED daytime running lamps, and chrome door handle, along with an updated infotainment system with navigation, air gesture control, and an SD card slot. 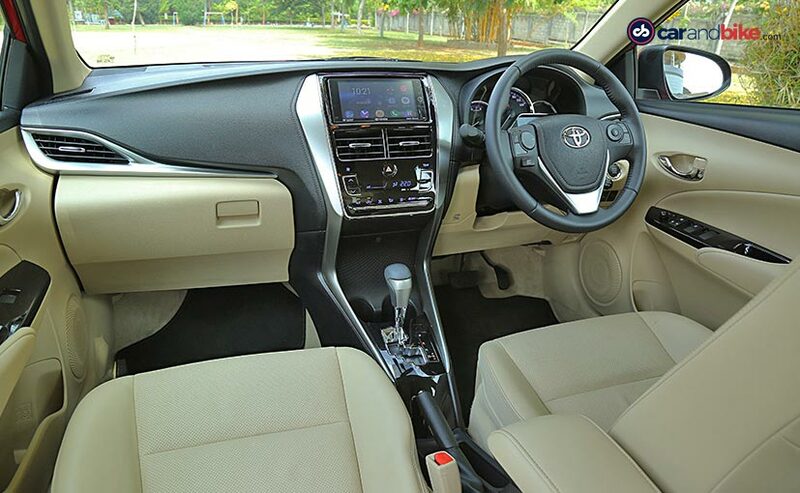 The cabin also gets an 8-way power adjustable driver seat, paddle shifter (CVT version only), and rear sunshade, while the safety features include vehicle stability control, and tyre pressure monitoring system. The Toyota Yaris will be offered in a total of six colour options - wildfire red, phantom brown, grey metallic, super white, pearl white, and silver white. The company also offers an array of exterior and interior accessories that come as an optional extra.